A superior comfortable all around saddle that is great for general pleasure riding, work & hunting. Big Horn synthetic saddle in black or brown. Features statinless steel rigging & breast collar dees. Incorporating the CAIR® Panel System and the EASY-CHANGE Gullet System® into a traditional leather saddle that builds on centuries of development allows Bates Australia to bring you a saddle with performance and comfort that is unsurpassed. The softest seat in town! Very comfortable with a medium deep seat. A true All Purpose saddle with padded flaps, that are long enough for riders wanting to practice more than one discipline. The Bates Innova will raise your expectations of a dressage saddle forever! Incorporating the Contourbloc®, CAIR® Panel System and the EASY-CHANGE Gullet System. Bates the most innovative saddle in the world. Incorporating the CAIR� Panel System. 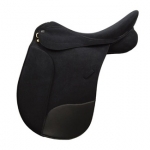 With SEF panels and stylish stitch detailing, this saddle can be adjusted through a traditional adjustable gullet system. An excellent high quality leather overlay girth with removable genuine sheepskin. This deep fitting helmet offers the same protection as the hampton version. Designed for your optimal performance and horse&apos;s comfort. Featuring our new, innovative Rotate-To-Fit system, this luxurious, soft covered leather saddle offers the same design as our popular Rivella Close Contact saddle and provides the rider extreme comfort and a close contact ride. Conventional boots and bandages insulate the horse's tendons and prevent heat from escaping. HDR designed this show jumping saddle for the Pan American Games winner, Cesar Almeida.